A strange way to start an entry like this. Don’t worry, we’ll soon reach the fun bits. In fact, you can skip straight to the “Fun Bits” heading of this post, and skip the “Inadequate Exchanges” part. Hmm, a lot of pictures, so we’ll put in a cut. I grew up in a poor household, and also a disagreeable household, in that it was an abusive one. It was very strange, actually. My father did the beating, and my mother (for the first 20 years of my life) did the making-up. So for instance, a night of screaming and having plates thrown at one resulted in one My Little Pony. ((I built up quite a large collection of MLPs, all gone now thank gods, that would have been any girl’s envy, but I didn’t actually show it to anybody, for probably obvious reasons.)) Boiling soup poured on the hands when my father didn’t like how I was warming up dinner resulted in a small shabby Sherlock Holmes book ((Good content, poor reproduction, of The Memoirs of Sherlock Holmes, with Paget illustrations.)). The one night of strangulation, I’m fairly convinced, resulted in the My Little Pony Paradise Estate. Oh, the little scraps of money that went into those things. We couldn’t really afford it, but I suppose my parents felt somewhat ashamed, and so I was actually spoilt while being abused. I don’t think this was a very good trade. I didn’t think it was a good trade when I was little either. My mother was well-intentioned, but I’m pretty sure this screwed me up in multiple ways, and a divorce probably would have been better. Or not. My father was ax crazy in some ways. Dear me, I wish my mother hadn’t lost it too, because it started including her doing both parts of the exchange towards the explosive end of it all. Anyways, I forget what small portion of hell resulted in this small gift: a travel version of TOMY’s Fashion Plates. 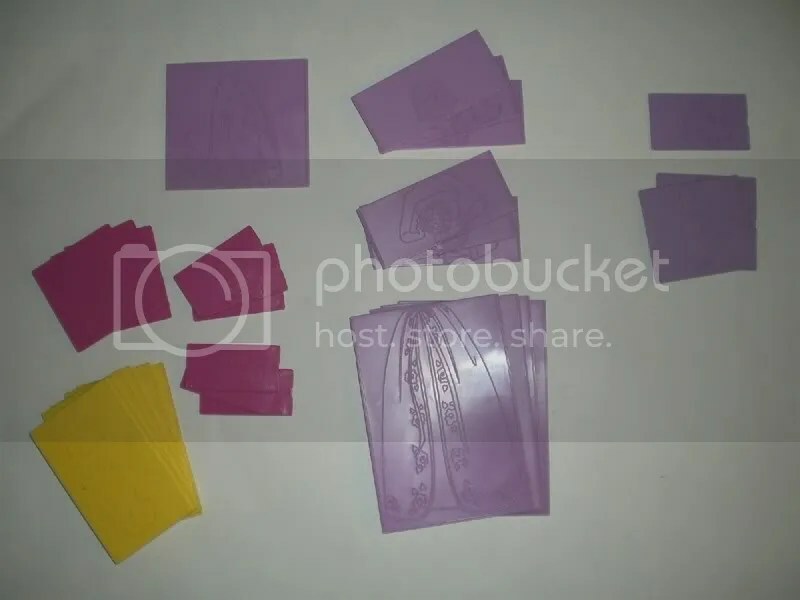 For the uninitiated, TOMY’s Fashion Plates was a simple but absorbing invention: get a bunch of raised textured plates, split into heads, bodices, and bottoms dressed in various clothes; a tray to allow a head/bodice/bottom combination and a small screen to clamp down a piece of paper; colored crayons or pencils to rub the assembled designed onto the paper, and thence to remove it and color it in. I didn’t have this kind of layout shown here. I had a smaller one, that produced pictures no bigger than a 3″x5″ index card, and the plates only had one tray to sit in (but it stacked relatively deeply). I loved it very much regardless, and I’m pretty sure what kept me interested was the large number of combinations available, along with the challenge of making some of the more outre ones presentable to a sane human being (I didn’t know at the time the insanity of the fashion world). No idea where it is now, and I don’t care to, but I had both the normal one and the one with bridal dresses. Anyways, this came up in my head spontaneously because of an intense memory of one of the abusive episodes, and afterward a musing on what happened thereafter, before I brought myself back to the present. It’s not been a nice week; and stressful work weeks bring out the bad times more often than easier weeks. So I cracked open my personal laptop for the first time in days, and surfed looking for pictures of fashion plates. 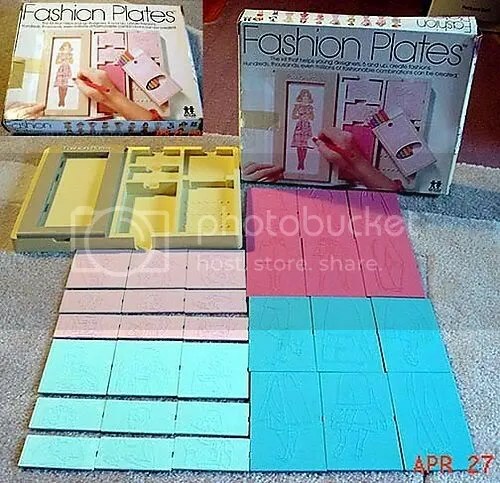 Even contemplating buying fashion plates again, because everyone sometimes comes up with stupid ideas of nostalgia. Through Google, I discovered that apparently the 80s produced awful versions of fashion plates such as to shake one’s belief in the sanctity of the human social systems, like Steve Urkel Family Matters and New Kids on the Block fashion plates. TOMY also attempted to target boys, with superhero fashion plates. I’m sure that wasn’t a great success. These days it’s Barbie fashion plates, and not much elsewhere unless you visit eBay, where you’ll find, in addition to Barbie sets, Disney Princesses, and Hello Kitty. And then I discovered that Klutz, modern makers of wonderful for-kids sets that range anywhere from magic tricks to games to cat’s cradles—they’re the large colorful spiral stiff cardboard books with special pockets and holders actually attached to the book, which is brilliance in terms of keeping everything together. Castle in a Spiral Bound! Seriously! I love Klutz, and wish I was a kid again. Er. Okay, no I don’t wish I was a kid again. Or if I was a kid again, it would be in a well-adjusted household that would let me have a few of the Klutz kits. Anyways, the Klutz folks have come up with a switch from the old plastic fashion plates, since those would be bulky, and a sturdy special holder is out of the question. Instead, you have thin paper and little clings that you can trace. They call their version of play fashion design “My Style Studio”. And with the clings, you can be so much more creative and flexible with your designs, since you’re not stuck to the quarter-quarter-half ratios, and can have different shoes and things. And, of course, everything can be stored in a spiral, Klutz-style. Perhaps the best part is that My Style Studio looks nothing like fashion plates, yet achieves the same ends. … I don’t know if I’m going to buy this. Probably not (though I do have both the Board Games v1—no longer purchasable—and v2, still purchasable and with cooler components anyways). Just rattling in my brains right now. But I’m glad that fashion plates continues. Also: mothers, you need not worry, in this day and age, if your little boy wants My Style Studio. Gods, rainstorm, windows open, must go close things. But there it is. My nostalgia for the night. I had the superhero version of this when I was a kid, the “Mighty Men and Monster Maker.” It is probably somewhere in my folks’ garage, with at least most of its parts. I used it to learn how to draw generic superheroes on my own, though I only ever learned one pose. My brother had a small set called “Little Van Go” that let you create custom vans. Hadn’t thought about these in years. If you were a kid in my household, you could have all the fashion plates you wanted. I bet my mom knows someone who still has an original set, tiny outlines of blue eyeliner and all. I wonder if the superhero plates were compatible with the fashion plates. Superheros and 70’s fashion models both often have ridiculously tiny waists. Supposedly all the fashion plates series were compatible with each other, although the vehicular ones (I had no idea those existed, until Michael brought them up) probably less so. Oh, wow, I’d forgotten about these. And go Klutz! SteelyKid will be having a lot of their toys, I foresee. I don’t know what to say…I can’t help you..but I understand grasping at one thing that made you happy. I’m sorry about the abuse. I’m sorry and I love you.